Ligation Independent Cloning (LIC) obviates the need for the time-consuming ligation step of traditional cloning methods. In traditional cloning, base-pairing in the short overlapping regions (usually 4 bp) does not provide enough stability to hold the plasmid together through the transformation/replication process. LIC employs long overhangs to form a stable association between fragments, allowing for transformation without ligation. Because of its dual polymerase/exonuclease functions, T4 DNA polymerase can create overhangs of varying length (typically 10-12 bp) based on a specific sequence. The annealed but nicked vector product is then repaired during the replication cycle. Empty vectors for LIC typically employ type II restriction enzymes (e.g. BsaI), which cut at a specified distance from their recognition sequence. This can create multiple distinct overhangs with a single enzyme, and remove the restriction sites from the final product (no "cloning scars"). A “stuffer” sequence allows for electrophoretic separation of linearized vector from the reaction mixture, and may provide counter-selection for negative clones as in the example shown here. The manufacturer of an LIC-specific vector will provide the homologous sequence which must be built into the 5’ end of the respective primers. 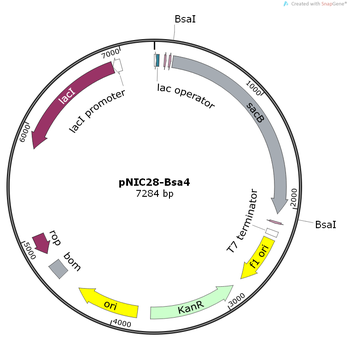 Below we use pNIC28-Bsa4 as an example of LIC experimental design. Step 1: Design Your Primers Primer design for LIC is often as simple as using the backbone manufacturer's suggested leader sequence fused to your gene of interest, in frame with the start codon or tag sequences (where appropriate). The primer length is dependent on the T4 Pol "chew back" reaction, in which a single dNTP is included to stop the exonuclease function of the enzyme and shift its activity back to polymerase. In our case, dGTP will be used in the reaction, meaning that T4 Pol will remove bases from the 3' end of the cut site until the first G is reached (shown in blue), at which point it will add back the G and become stalled. Therefore, the primer must begin with the following T, so that there are no gaps in the final assembly. In this case, 15 bp of homologous sequence is used, plus a minimum of 18 bp of your template sequence. 5' and 3' primers will have different leader sequences, but operate on the same principle (homologous to the first G on 3'-5' strand from cut site). For simplicity, only the 5' primer is shown here. Note: Use web-based primer design software to ensure a melting temperature between 50-60°C for your PCR primers. Note: Elute your purified digestion and PCR products with sterile water (instead of TE buffer) to ensure optimal salt concentrations in subsequent reactions. Step 3: Create Vector Overhangs Treat the linearized vector with T4 DNA polymerase to "chew back" the free 3' ends, following the manufacturer's instructions. In this case, we will include the free nucleotide dGTP in the reaction (exclude all other nucleotides from standard polymerase protocol), causing the enzyme to perform exonuclease activity until the first "G" in the sequence. Because the polymerase reaction is favored over the exonuclease reaction, the polymerase will add back the guanosine residue and become stalled. A typical T4 Pol reaction is shown. Mix the components (add the T4 last) and incubate at room temperature for 30 minutes. Inactivate T4 Pol by heating to 75° for 20 minutes. Step 4: Amplify Insert by PCR Perform PCR amplification of your insert following the instructions provided by your polymerase manufacturer. It is very important to remove all free nucleotides from your PCR product before proceeding, as they will interfere with the exonuclease activity of T4 Pol in the following step. This may be accomplished by gel purification. Step 5: Create Insert Overhangs Treat your purified PCR product with T4 Pol in the presence of dCTP (not dGTP), corresponding to the first base removed by the restriction digest to create the free 5' end of the cut vector (shown in blue here). The T4 reaction may be stopped by heating to 75° for 20 minutes. Step 6: Anneal and Transform Mix your treated vector and insert at a molar ratio of 1:2 or 1:3, using between 20 and 50 ng of vector per annealing reaction. This should be done in a small volume with no additional water (<5 μl). It is advisable to set up multiple reactions by holding the vector concentration fixed across multiple concentrations of insert, thereby increasing your chances of success. Set up a vector only control with water instead of the insert. Incubate the annealing reaction for 5 minutes at room temperature, then add 1 μl of 25 mM EDTA, followed by another 5 minutes at room temperature. The reaction is now ready for transformation. Use 1-2 μl of annealing reaction for each transformation, following a standard protocol.